Easy weeknight dinner idea? 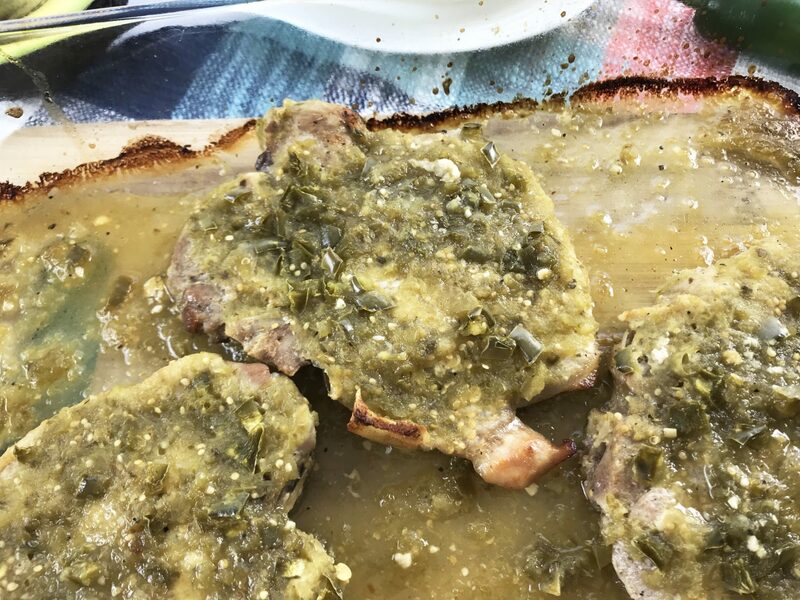 Salsa Verde Pork Chops for the win! 1. Preheat the oven to 350 degrees and spray an 11×7 baking dish with non-stick cooking spray. 2. Heat the olive oil and minced garlic in a large frying pan. 3. Brown the pork chops on both sides and season with salt, pepper and cumin. 4. Remove the pork chops from the pan and place in the baking dish. 5. 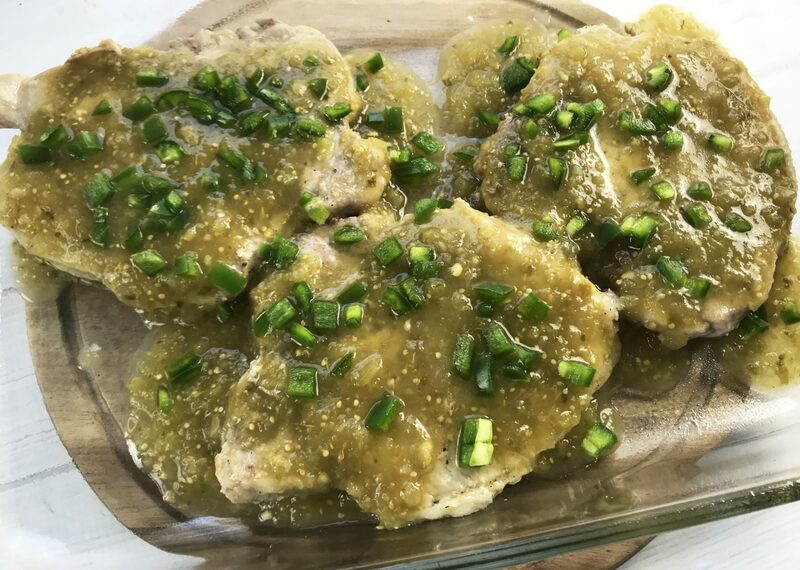 Pour the salsa verde over the pork chops and top with diced jalapeno. 7. Remove from the oven and serve with diced avocado, salad or riced cauliflower. 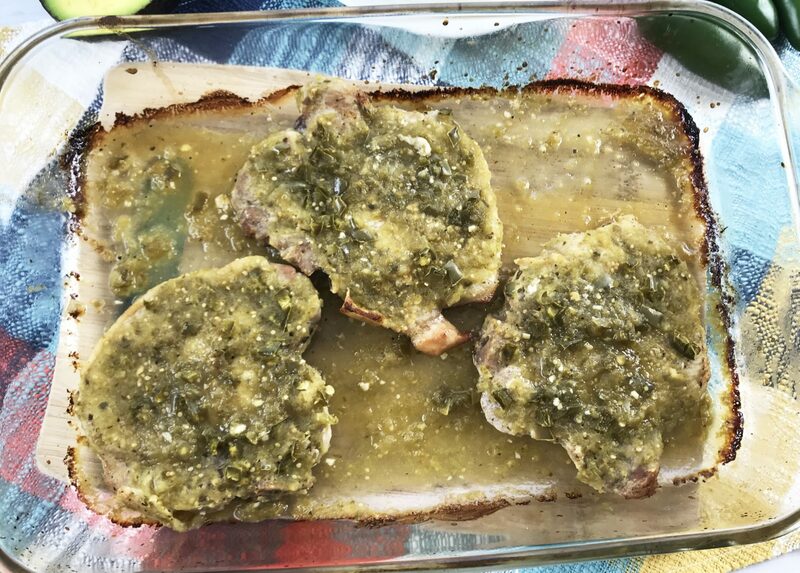 If you like pork chops and you’re looking for a new way to make them, maybe give these Salsa Verde Pork Chops a try? And in case you’re wondering, my kids take after me and pork chops are officially OFF our menu. For good. oh wow i never thought i would try this with pork chops but this looks SOO yummy! my husband would enjoy this too! cant wait to make this soon! I’m sure my family would like these. We enjoy pork chops now and again. Plus I’ve always been a fan of salsa. I like my food with a kick to it. I like salsa verde on just about anything! I was actually looking for some good pork recipes because I have not made pork in a long time. This one will definitely be added to the menu. What an inventive dinner idea for pork chops! I usually make the same old recipe: lemon pepper seasoning, which is good in itself; but, this looks quick and easy. It always about the taste sometimes it is the texture of the food. For example to dry and tough. 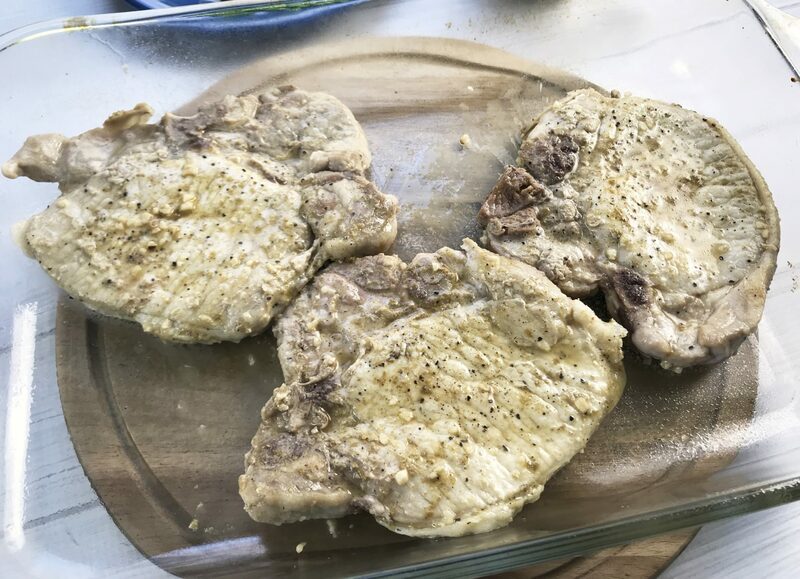 My family loves pork chops and will have to try out your recipe. Oh wow, these sound really delicious! So easy to make too. I need to add this to my next meal plan. Those look so good! I’m a huge fan of salsa verde. I’ve had it on everything from tamales to eggs. I’ve never had it like this before, though. I could see my husband enjoying these Pork Chops but I have to watch what I eat because I can’t have Spicy Foods. These pork chops seem both easy and delicious! Anything with intense flavor and a little heat is a win in our family. I’m always looking for something new to do with pork chops. We always had them with shake and bake and I thought it was gross, but it turns out I really like pork. I don’t eat meat anymore, but I know my husband would love this dish! Maybe I’ll make it for him sometime. Ok, that is going to be on my dinner menu soon! I love how tender and delicious this looks. My family adores Mexican, so I know they will love it. We do this with chicken a lot, I bet it is great with pork chops too! Those look amazing I’m a huge fan of salsa verde, I put it on everything, but I’ve never had it like this before, though. These pork chops looks really good! I make salsa chicken a lot but I need to mix it up and try this! YUM! I love that you added jalapeño in it, my kind of flavor. I would try this recipe the next time I make pork chops. I’ve been looking for a new pork chop recipe! Can’t wait to try this one out! Oh, wow! 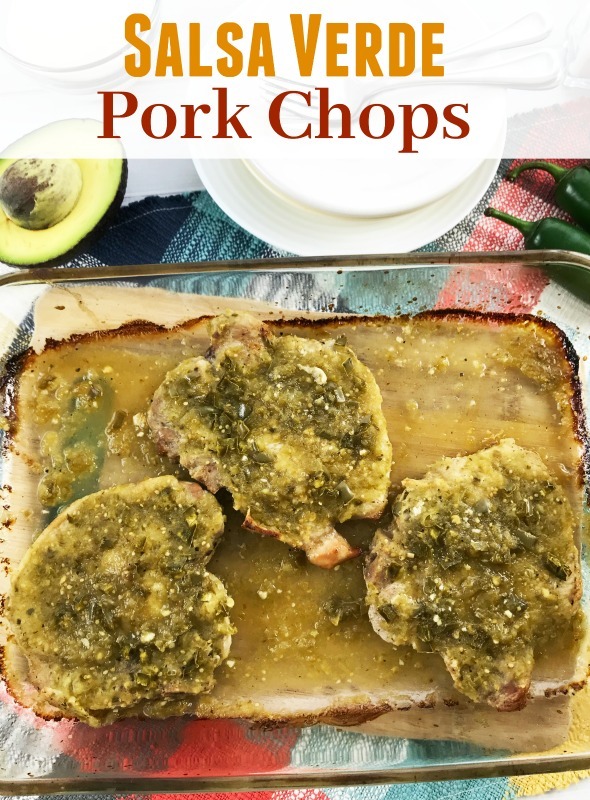 Pork chops with avocado?! That’s an interesting combo! I will have to give that a try. Oh so yummy! I need to cook it this weekend. I bet it is delicious! Those porkchops look absolutely delicious! This is my secret sauce for pork loin! I never thought to use it on pok chops! Brilliant idea, will have to use this next time instead of only saving it for the pork loin. 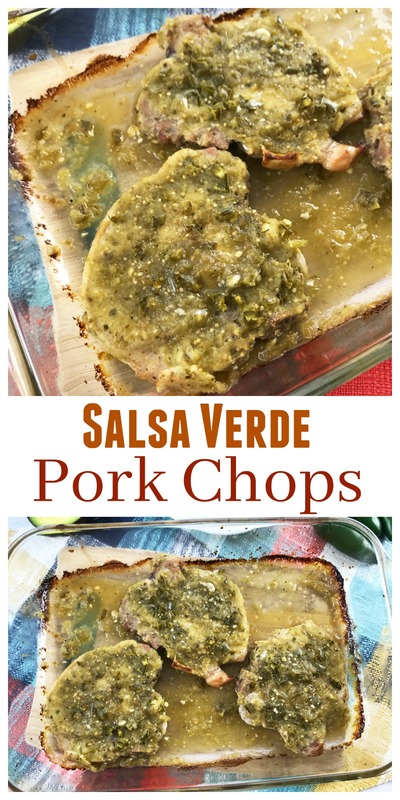 This Salsa Verde Pork Chops looks really yummy. I would love to try this on our picnic next week! I love how simple this looks. I bet it tastes great and could go with a starch or veggie! Now my family would like this on the weekly menu! Wow, That is so good and looks so delicious recipe to try. Next time I’ll make mine! !